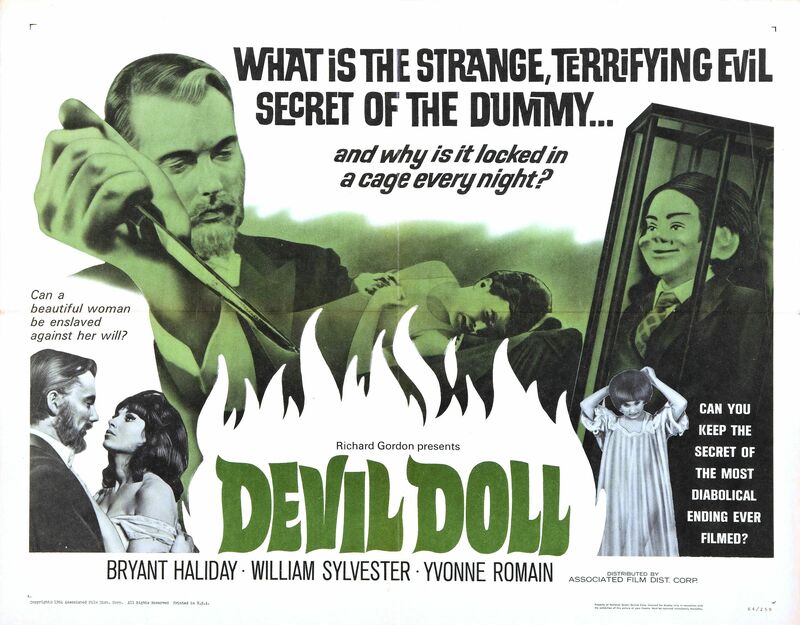 Cinema Sunday: Devil Doll (1964) | Magazines and Monsters! Distributor: Associated Film Distribution Corp.
With Christmas in the rear-view mirror, I thought I’d take a look at something a bit more odd than I usually review. This little-known film has one of the creepiest things in it that can make a lot of people freak out. 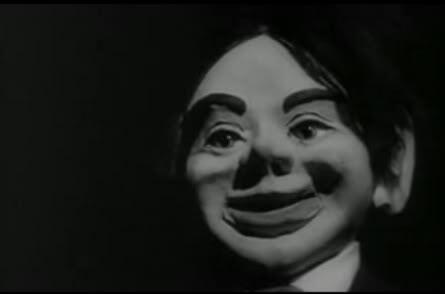 A ventriloquist dummy is one of those things that looks harmless enough, but just the mere thought of it acting independently, gives most the creeps (me included)! Throw in a little mystery and murder, and voila, you have an eccentric film with more than most big budget films can offer. Admittedly, Yvonne Romain was the only face I recognized right away. 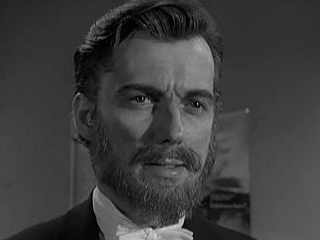 Bryant Haliday did look a bit familiar, but looking at his list of credits, I’m not quite sure where I may have seen him pop up in the past. Well, let us not delay any further. 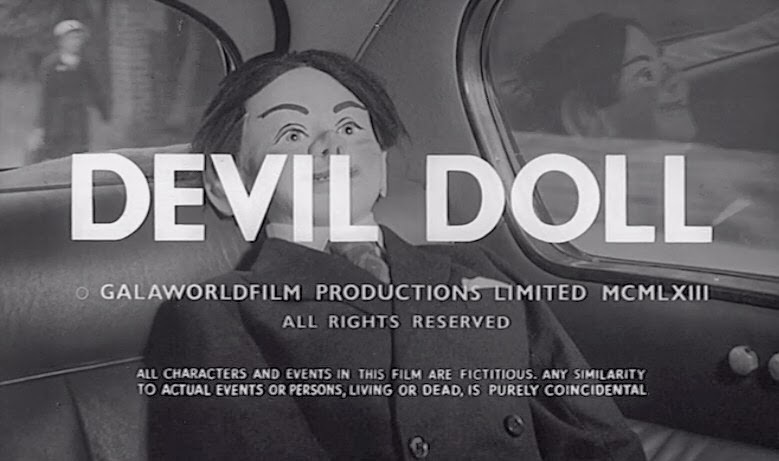 I now present to you, the doll that would make Chucky shake in his boots, Devil Doll! The film begins with the Great Vorelli (Bryant Haliday – image below), in a cab, heading to the theater for a performance. We see that the main attraction of his show is a ventriloquist dummy, that he uses with astonishing results. He somehow drinks a glass of wine, while the dummy still speaks! The crowd is in awe, and the performance ends with that feat. Vorelli then retreats to his dressing room, and we see something that seems a bit off. Vorelli locks “Hugo” in a cage, and not just putting him a case or on a table. His assistant, Magda (Sandra Dorne), seems unsettled, but also as if she knows something about this strange ritual. 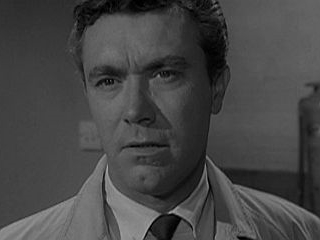 The next day, a newspaper reporter, Mark English (William Sylvester), is discussing the buzz around London about the great Vorelli. He and a coworker have a young woman lined up to go on stage as a volunteer, to try to figure out his secrets, but the girl backs out. In a pinch for a good-looking young lady, Mark calls one of his flames, Marianne Horn (Yvonne Romain), and she accepts. The two then go to the next performance, and Marianne volunteers, just as planned. Vorelli hypnotizes her, and makes her dance with a man. He also seems to be aroused by her as well, and you get the impression that he wants to do more than just make her dance. And once again for the finale, he brings out Hugo, and the two talk. Vorelli then pours some wine, and Hugo asks for some, but Vorelli tells him that he cannot have any. He then orders Hugo to go to the edge of the stage, and take a bow. After some prodding, he does just that, and the audience is amazed. Vorelli then commands him to return to his “master,” and he does. Back stage, Vorelli locks up Hugo once again, and Vorelli tells Magda that he’s going to get Marianne in his thrall. She seems less than excited. On the drive home, Mark puts the moves on Marianne, and the two get jiggy in the car. Marianne agrees to help him prove that Vorelli is a phony. They make a plan to invite him to Marianne’s aunts party, and then Mark will sneak into Vorelli’s room and examine the dummy. Marianne then goes to Vorelli’s room to invite him to the party. He then hypnotizes her, and tells her that she’ll obey his commands, and when he calls, she must come to him. He recognizes her family connection, and knows she’s rich, so he not only wants her because she’s beautiful, but because she’s loaded as well. Vorelli puts on his show at the party, and Hugo is even more disobedient than normal. At one point, Hugo picks up a knife and almost stabs Vorelli! The crowd is shocked, and gasps with fear, but Vorelli commands him to put down the knife and apologize to the crowd. He then puts Hugo away, and then starts to seduce Marianne. In the meantime, Mark heads upstairs to check out Hugo. Vorelli takes this opportunity to entrance Marianne even more, and now she’s completely under his control. Mark inspects the dummy, but can’t find anything unusual with it, so he leaves. Later that evening, Vorelli mentally calls out to Marianne, and she comes to his room. he then seduces her. As mark is sleeping, Hugo comes to his room, and tells him a secret. He tells him about Berlin, in 1948. The next morning, Mark is telling a coworker about this, and the girl thinks it was a dream. Mark tells her it wasn’t but the girl won’t listen to him. Mark gets a call that Marianne isn’t well, so he heads over to her place immediately. When Mark arrives, she’s in some sort of coma, but wakes up momentarily, and tells Mark that “he keeps calling me” and she wants “him” to stop. The next day, Vorelli scolds Magda for not getting the job done. She then threatens him with the police, but he puts on the charm, and then they make whoopee. The next morning, a friend of Mark’s, Dr. Heller (Karel Stepanek), shows up, and mark tries to convince him of Vorelli’s madness. He tells him about the encounter with Hugo, and the talk of Berlin. Back at Vorelli’s place, he tells Hugo that Magda said he was ugly, and apparently this is enough for Hugo to become enraged and murder her. Vorelli has an airtight alibi, we assume from hypnotizing others. Mark theorizes that Vorelli killed her, and won’t rest until he exposes Vorelli! I’ll stop here, but rest assured that there’s more to the dummy than meets the eye, and in the end, Vorelli gets what is coming to him! This little film is a good creepy watch on a Saturday afternoon. There isn’t a ton of intrigue, and you can kind of figure out what’s going on before the big reveal. This doesn’t take away much from the movie though, and it has a certain charm that movies from that era possess (for the most part). Towards the end of the film, two of the characters travel to Berlin, and do some investigating. That’s a really solid part of the movie, and gives it some credibility. There is some cheesy/creepy scenes that are overtly sexual (for the 1960’s), but they don’t override the rest of the flick. As far as sets go, there wasn’t anything too exciting. The scenes of Vorelli during his performances were pretty good, and the theater looked authentic enough. The music score was below average, but you really didn’t need anything over-the-top to enhance the film. The last scene was pretty cool, even though the “fight” was kind of silly. Any way you slice it, the movie is worth checking out, so do it! Great write-up! Will have to watch this now as it is my kind of picture.